California must suit Peter Sagan (SVK) of Liquigas-Cannondale well. The 22-year-old rider overcame a flat tire five kilometers (3.1 miles) from the finish only to be towed back up to the pack at more than 40 miles per hour to pass his challengers within the last 100 meters to win Stage 1 of the 2012 Amgen Tour of California before tens of thousands of screaming fans in Santa Rosa. 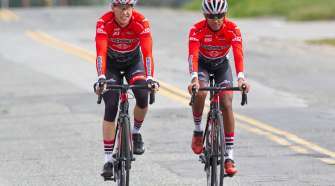 Today’s stage kicked off the seventh edition of the race, which will take cyclists nearly 750 miles throughout some of California’s most iconic terrain, including the Pacific Coast, Mt. Diablo and Big Bear Lake over the next six days, before ending at L.A. LIVE in downtown Los Angeles on Sunday, May 20. Record crowds came out in Santa Rosa to support the world-class field of 128 riders, who headed out behind Santa Rosa native and three-time Amgen Tour of California winner Levi Leipheimer (USA) of Omega Pharma-QuickStep on two short neutral laps before setting out on the 115.9-mile course. The Stage 1 route took cyclists through the Sonoma wine country before winding up and over to the Pacific Coast, and then back into Santa Rosa, where Sagan outsprinted Heinrich Haussler (AUS) of Garmin-Barracuda and Fred Rodriguez (USA) of Team Exergy to take the Stage 1 victory. After two neutral laps around Santa Rosa, the riders wasted no time attacking, resulting in six riders off the front. Included in the breakaway was Maxime Bouet (FRA) of AG2R La Mondiale; Jeff Louder (USA) of UnitedHealthcare Pro Cycling Team; David Boily (CAN) of Team Spidertech Powered by C10; Andrew Dahlheim (USA) and Ben Jacques-Maynes (USA) of Bissell Pro Cycling; Sebastian Salas (USA) of Team Optum Powered by Kelly Benefit Strategies; Josh Atkins (NZL) of Bontrager Livestrong Team; and Sam Johnson (SUI) of Team Exergy. 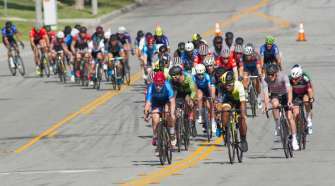 As the road tipped upward, the peloton closed in on the breakaway, dropping the gap to eight minutes and 45 seconds. At the half-way mark in the stage and 10km from the day’s first KOM, the break was eight minutes and 30 seconds ahead of the peloton as they rolled down River Road. Boily picked up the day’s first King of the Mountain (KOM) points on Cazadero Highway, followed by Salas and then Atkins. This same group crossed the second and third KOMs of the day, both on Fort Ross Road, in the exact same order. With 60km to go, the break still held a lead of eight minutes and 15 seconds over the peloton, with RadioShack-Nissan-Trek working the most to reel them back in. 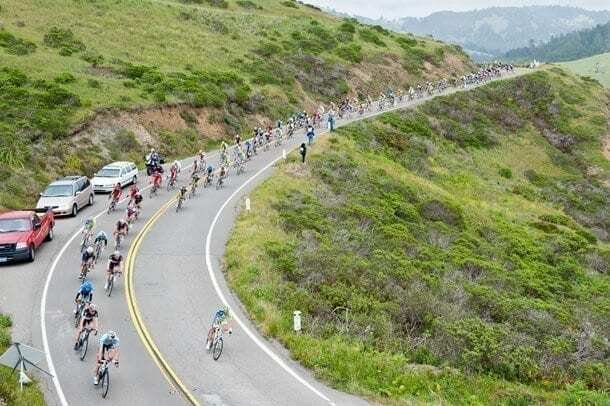 Turning inland, the riders headed toward their fourth and final KOM of the day on Coleman Valley Road, where the peloton began to stretch out, with RadioShack-Nissan-Trek and Garmin-Barracuda putting in the most effort. Boily crossed the KOM line first, followed by Salas and Bouet. Stretching to a single line, the peloton trailed the breakaway by only 40 seconds. As the peloton closed in, Boily was absorbed, leaving only Jacques-Maynes, Bouet and Louder. Team Rabobank continued to drive the chase and eventually caught up with the three leaders. Shortly thereafter, Sagan flatted, but was able to work his way back up to the front. Just outside of the 3km, there was a crash that took out notable sprinter Michael Matthews (AUS) of Rabobank. Sagan managed to avoid the trouble and sprinted to the finish. Haussler finished second and Rodriguez crossed the line at third. 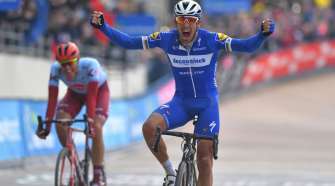 At the end of the stage, race leader jerseys were awarded as follows: Sagan claimed the Amgen Race Leader, Visit California Sprint and the Rabobank Best Young Rider Jerseys. Since Sagan will be wearing the Amgen Race Leader Jersey at the start of tomorrow’s stage, the Visit California Sprint Jersey will be worn by Haussler and the Rabobank Best Young Rider Jersey will be worn by Atkins. Boily will wear the polka dot Nissan King of the Mountain jersey, Leipheimer will be wearing the Amgen Breakaway from Cancer® Most Courageous Rider Jersey, and Jacques-Maynes claimed the Exergy Most Aggressive Rider Jersey. Throughout the 2012 Amgen Tour of California, Amgen will honor and celebrate cancer survivors through a variety of events including official race starts and jersey presentations. In addition, Amgen will host four Breakaway Mile events, a special one-mile walk that crosses the finish line to honor millions of cancer survivors. “Amgen was born and is headquartered in Thousand Oaks, Calif., and we are proud, for the seventh year, to sponsor an event that promotes the beautiful state of California and stimulates the local economy,” said Stuart Arbuckle, vice president and general manager, Amgen Oncology. “his race provides Amgen not only the opportunity to be part of a world-class professional cycling event, but also to raise awareness for Amgen’s Breakaway from Cancer® initiative,” continued Arbuckle. Amgen created the national Breakaway from Cancer initiative in 2005 as a complementary component to its title sponsorship of the inaugural Amgen Tour of California. Breakaway from Cancer is a collaboration between Amgen and four nonprofit organizations – Prevent Cancer Foundation, Cancer Support Community, Patient Advocate Foundation and National Coalition for Cancer Survivorship. These organizations offer a broad range of support services complementing those provided by a patient’s team of healthcare professionals. For access to resources or to learn more, visit breakawayfromcancer.com. In honor of cancer survivors and advocates everywhere, today during the Santa Rosa Breakaway Mile, advocate Marc Van Riper, Cotati, was recognized and celebrated as the local Breakaway from Cancer Champion. Van Riper co-founded Kathy’s Camp for Kids, a nonprofit organization dedicated to meeting the needs of children of cancer patients. Kathy’s Camp for Kids is a place where fear of cancer is replaced with fun, friendship and encouragement. During the event, Van Riper was joined by approximately 150 community members – cancer survivors, patients, caregivers, and advocates – and Amgen’s Terry Rosen, vice president, Therapeutic Discovery, who plays a crucial role in developing innovative medicines to treat cancer and other serious illnesses.